Dazzle and delight someone very special with this sophisticated gift filled with Regalo Valley Ranch sparkling wine and sweets. This beautiful embossed lovely gift container holds a classy sparkling wine and includes a box of chocolate truffles, Holly Baking cookie brittle, milk chocolate almonds, and much more. 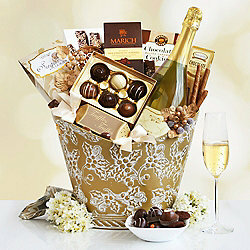 They are sure to enjoy this chic gift basket.